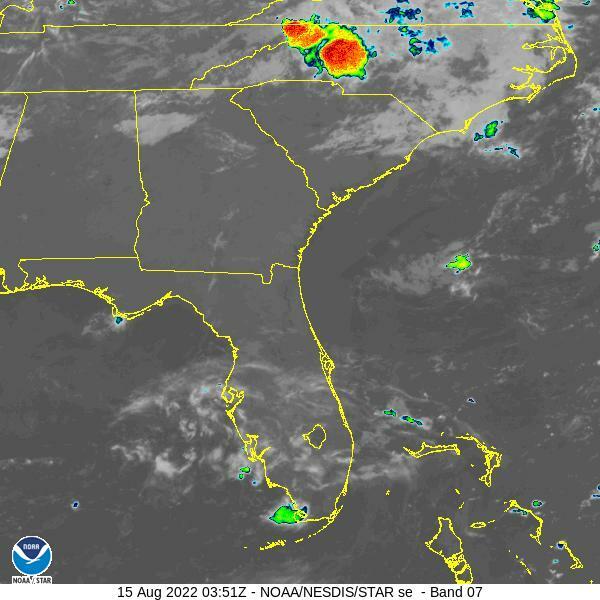 Below you'll find the latest satellite image loops, radar animations and other Florida weather information. You'll also be able to see if those pesky clouds are going to blow off at night, or if fast moving water vapor is going to mess up 'the seeing'. Below is the current NOAA GOES 16 Clean Longwave IR (10.3 micron) image loop showing clouds in the infra-red spectrum (great at night time.) See the UTC clock time above to compare with the image time stamps. BELOW IS THE LATEST COMPOSITE IMAGE FROM NOAA'S GOES 16 SATELLITE. SEE THE TIME STAMP AND COMPARE IT TO THE TICKING UTC CLOCK ABOVE. 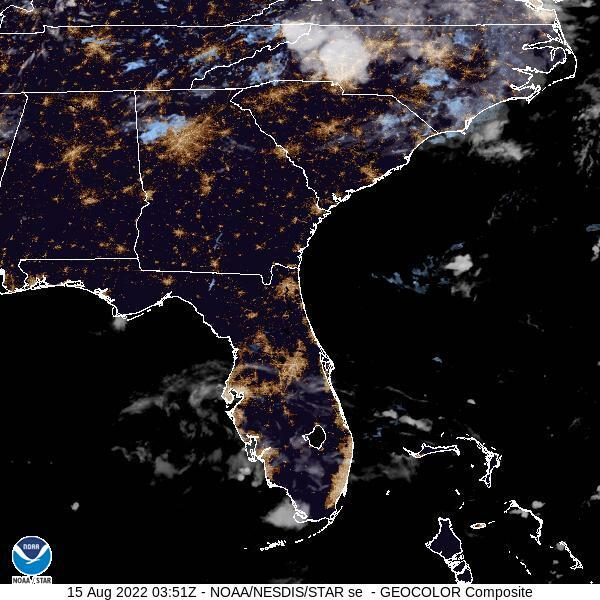 AT NIGHT IT WILL SHOW IR CLOUD IMAGES SUPERIMPOSED OVER A LIGHT POLLUTION IMAGE BY NASA. IT IS LESS SENSITIVE TO CLOUDS AT NIGHT, WHERE LOOKING AT THE OTHER IR IMAGES ON THIS PAGE MAY BETTER CHARACTERIZE YOUR LOCAL CONDITIONS. BELOW IS THE LATEST SHORTWAVE IR (3.9 MICRON) IMAGE (ALSO SHOWS CLOUDS AT NIGHT) FROM NOAA'S GOES 16 SATELLITE. 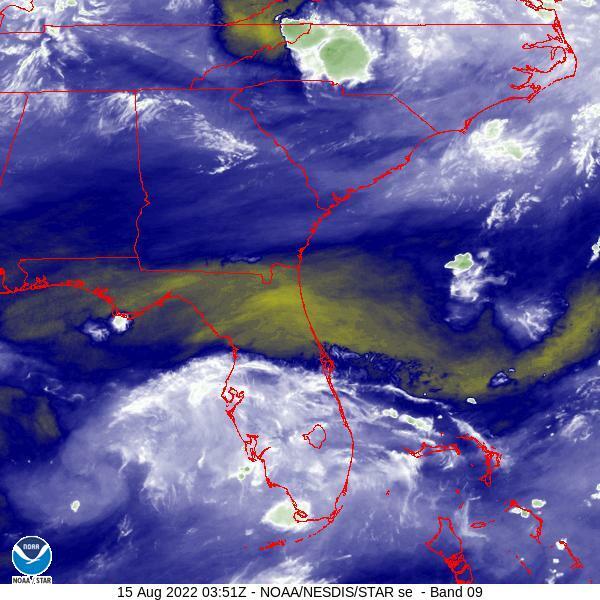 BELOW IS THE LATEST WATER VAPOR IMAGE FROM NOAA'S GOES 16 SATELLITE. SEE THE TIME STAMP AND COMPARE IT TO THE TICKING UTC CLOCK ABOVE. BELOW ARE THE CURRENT WEATHER RADAR ANIMATIONS FROM THE NATIONAL WEATHER SERVICE. Below is the weather at Chiefland Astronomy Village. Although the Astronomy weather might say "Good" or some other positive rating, it doesn't consider 'the seeing', which can be very bad (even with a Good rating.) One way to evaluate 'the seeing' is to see how fast the water vapor .gif image above is moving, if it's moving very fast 'the seeing' will be bad, if it's very slow or not moving, it will be much better. Another way is to check A Danko's 'seeing' prediction. This Florida Astronomy website is not affiliated with the National Weather Service, NOAA, A. Danko, Accuweather or any other entities.